On 18 May and 1 June 2016, the National Heritage Board invited specialists from the National Archives of Estonia to evaluate fire damage to Piirissaare Old Believers prayer house books and carry out rescue operations. Thanks to active and effective measures in rescue operations in cooperation between the National Heritage Board, people and congregation members of Piirissaare and conservation staff from the National Archives, the spread of major water damage in valuable volumes was avoided. The congregation opted to hand over 8 important prayer books to the National Archives that included specialists from Estonian National Museum, Tartu Art College, University of Tartu Library, National Library of Estonia and City Archives of Tallinn to carry out conservation work. Most of the leather-bound books from the end of the 19th century and beginning of 20th century had sustained significant fire damage. Edges of covers and text block, headbands and spine had been destroyed. Extinguishing efforts had also caused water damage and soil. 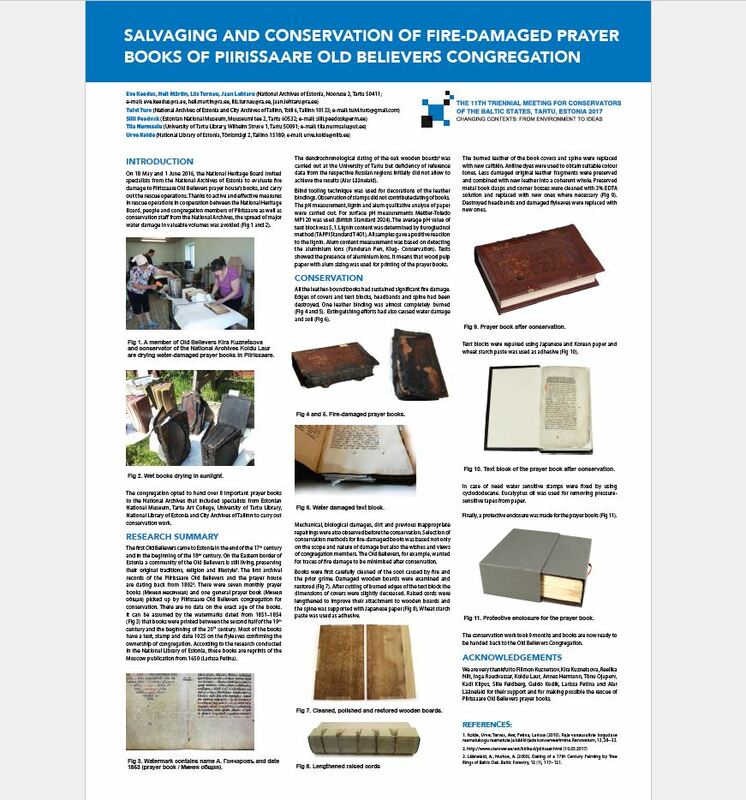 Selection of conservation methods for fire-damaged books was based not only on the scope and nature of damage but also the wishes and views of congregation members. The Old Believers, for example, wanted for traces of fire damage to be minimised after conservation. cleaned and replaced with new ones where necessary. The conservation work took 9 months and books are now ready to be handed back to the Old Believers Congregation.